Advances in arthroscopy - Orthopedic Surgeon For Hip, Knee Surgeries at Zehr Center In Naples Florida. Advances in arthroscopy result in minimally invasive surgery. It used to be that when an orthopaedic surgeon “scoped a joint” all he or she could do was look inside the joint. But the development of tiny video cameras and instruments allow surgeons to do more than simply take a look. Now they can perform actual surgical procedures through the arthroscope. Maximizing the use of the arthroscope in surgical procedures results in minimizing the size of the incision needed to perform the procedure. This minimally invasive arthroscopic surgery provides several benefits to the patient. It allows the joint to remain closed and reduces the risk of infection and drying out of the articular cartilage. Because of this, the healing time for most arthroscopic procedures is greatly reduced. Rehabilitation is faster, and unnecessary damage to normal structures is avoided. 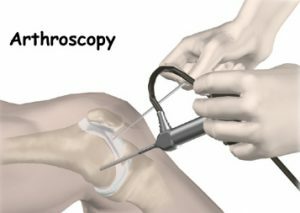 Just about every joint in the body has been scoped, but a majority of surgical procedures done with the arthroscope are done on the knee. The knee was the primary site of arthroscopic procedures in the early days of arthroscopy. It continues to be a common target of the scope. Probably the most common use of the arthroscope initially was to remove loose bodies from the knee joint. A loose body is a fragment of bone or cartilage that moves around inside the joint. The fragment can get caught between the two bones of the joint and cause pain. Now, very complex surgical procedures are done inside the knee with the aid of the arthroscope. It is important that you choose an orthopaedic surgeon skilled and experienced in arthroscopic surgery. The Zehr Center for Orthopaedics is the leading orthopaedic practice for knee arthroplasty in Fort Myers, Naples and the surrounding Southwest Florida area.